The Apprentice Stone Map has been released! This map will be in the new novel, The Apprentice Stone, due to release in ebook this Saturday, October 7th on Amazon. I plan on releasing the print version (soft-cover) in about a month. 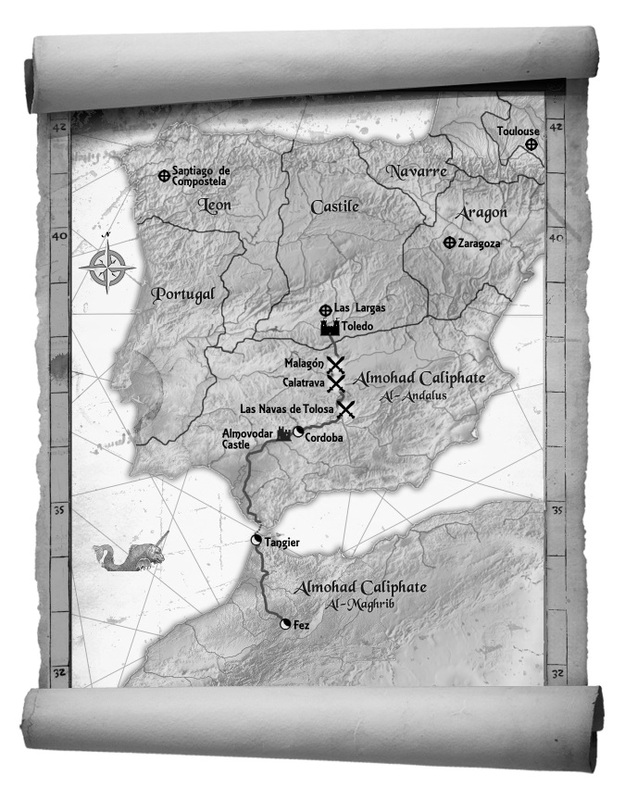 The ebook version will have the colored version of the map, and the print version will have a black and white version. 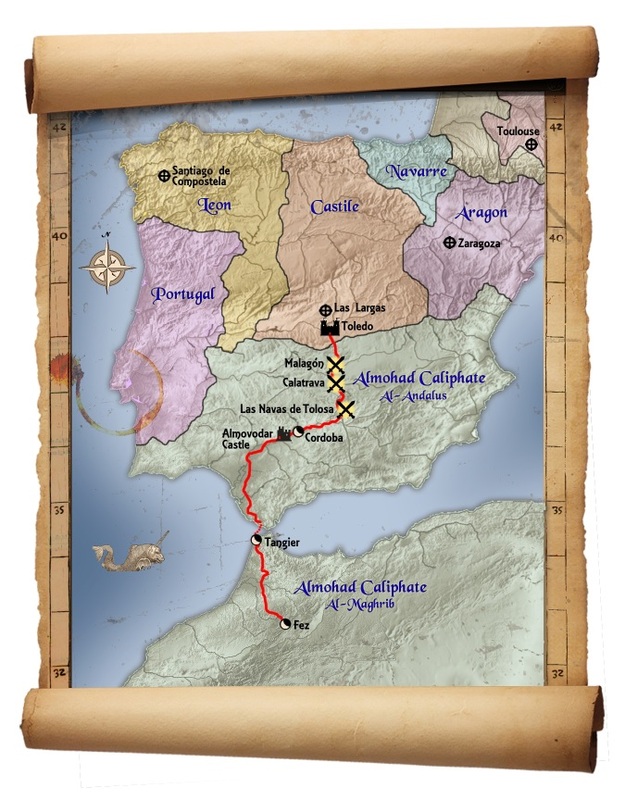 The map shows the main character’s (Francisco) journey from Toledo, Spain to Fez, Morocco. These are the modern names and not the names used in 1212 AD when the novel takes place. At that time, Spain split into several Christian kingdoms in the north, and part of the Muslim Almohad Empire in the south. The Almohad Empire also stretched across northern Africa. In 711, Tariq Ibn Ziyad led of an army of Berbers from north-western Africa into southern Spain. There he defeated the Visigothic army, led by King Roderic. In five years, the invasion/conversion consumed the entire peninsula and poured over the Pyrenees Mountains into the Frankish Kingdoms. On 10 October 732, Charles “The Hammer” Martel lead an army that defeated them at the Battle of Tours. The remnants of the Visigoth in the north (the Kingdoms of Leon, Portugal, Castile, Navarre, and others) pushed the Muslims back. This effort took centuries and became known as the Reconquista. The last Muslim stronghold of Granada fell in 1492. Battle of Las Navas de Tolosa broke a major stalemate in the Reconquista. (See the sword crossing on the map that shows the battle’s location.) The characters in “The Apprentice Stone” play key rolls in this battle and the larger conspiracies that lay behind it.